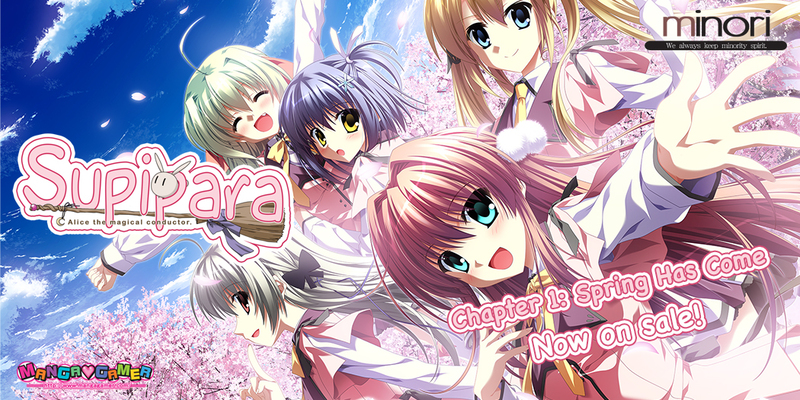 Supipara Chapter 1 Now On Sale! Supipara: Alice the Magical Conductor, Chapter 1: Spring Has Come is now on sale! You can pick it up right now on MangaGamer.com and Supipara Ch. 1 will also be available on Steam later today. The protagonist, Yukinari Sanada, has returned to his hometown in Kanagawa Prefecture, Kamakura City, for the first time in seven years, and is greeted by his older cousin, Sakura Narumi (complete with maid outfit). He wanted to live in peace, but his life at the academy placed on the coastlands becomes bustling and brilliant while surrounded by a lineup of members with booming personalities like Hotaru Amano, the sharp tongued, half-Japanese beauty, and Alice Kamishiro, the lazy witch who loves modern-science and mail-orders. Eventually, our protagonist is coaxed into joining the action committee for the academy’s traditional beauty contest by his close friend. He interacts with the heroines participating in this contest who are cute but each have an idiocyncrasy or two. Fun events (with their own difficulties) pop up again and again. Your story with “her” about smiles, peace, passion, and love, all while borrowing the power of a witch, is about to begin! Localization of Chapter 1 of Supipara was made possible through the generous support of English-speaking fans. Sales of Supipara will go toward funding the localization and development of later installments of the game. For more information or to follow funding process, check out the Minori Fundraising Project page.